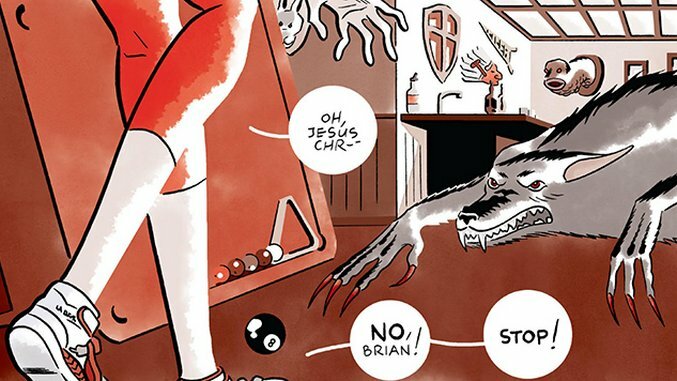 She Wolf #1 is as much a battered, clamshell VHS of ‘80s horror worship as it is a comic. 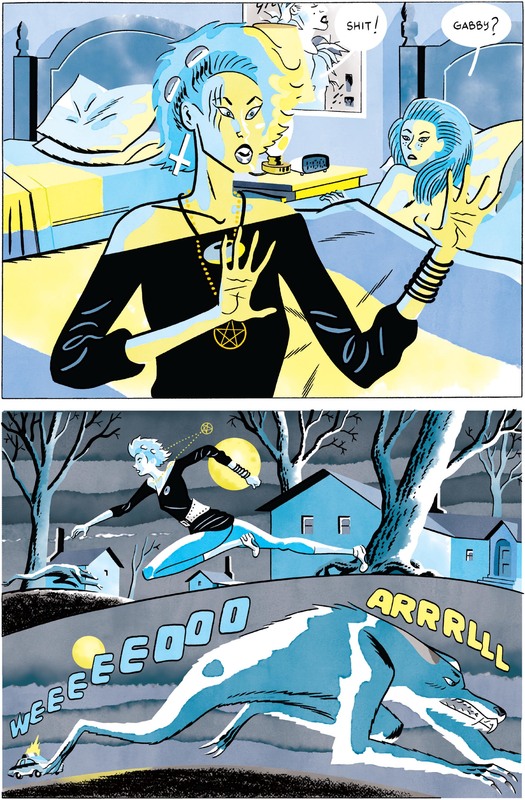 Writer and artist Rich Tommaso weaves a disorienting fever dream around a teen girl’s battle against her snarling inner beast. Surprisingly, the narrative’s themes overlap considerably with Image sister title Cry Havoc, exploring the internal struggle of chaos and order, id and superego, as instinct slowly overrules constraint to the chagrin of the affected. But Si Spencer’s budding epic of humans channeling bestial gods revels in intellect and philosophy—She Wolf is something you look at and feel. Tommaso’s former day job was coloring Carl Barks’ utterly fantastic Donald Duck and Uncle Scrooge reprints at Fantagraphics. That mastery of hue and texture shines through every panel of She Wolf. The colors avoid realism at every juncture, with characters falling into Dario Argento pools of rusty red (the first two visceral pages) and steely blue (the next five) before reverting to a less stylized palette, as 18-year-old protagonist Gabrielle Catella attends high school. Even a wolf attack appears as a jagged wash of obsidian ink instead of an organic bramble of limbs, teeth and lacerations. Like the internal conflict of its characters, moody instinct trumps an obligation to more formal rules. Past those deep watercolor stains, the illustrations parade a litany of easter eggs and symbols. The story follows Gabrielle as she struggles against a familiar infected by lycanthropy as well as displays symptoms herself—and looks damn good doing it. She mimics Madonna’s shoulder-bearing dress and massive crucifix earrings, the latter flipped upside down to match a pentagram necklace. Logically, material girls probably worshipped the dark one during the Reagan Era. Another surreal sequence adorns Gabrielle in a long red hood before encountering a particularly grim scene involving Grandma. The characters even share some visual similarities to Patrick Nagel’s pale, svelte figures, often remembered more prominently than the Duran Duran covers they grace. 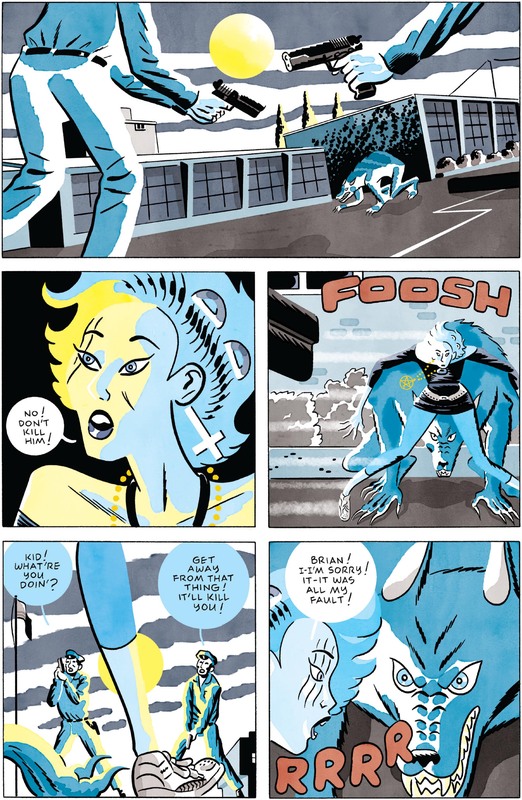 Tommaso treats this comic as a canvass of visual postmodernism, likely fueled by the same grindhouse love as Tim Goodyear’s Video Tonfa. For those who can appreciate it, the comic carries a legacy along with its plot and lovely art. Aesthetic aside, these inaugural pages seem strictly devoted to establishing how little control the central character exerts, either over her hairy transformation or the jolting start-and-stop rhythm of her life. At one moment Gabrielle witnesses a violent nighttime police encounter, the next she’s inexplicably school bound as the sun rains down a clarity she can never quite sustain. Drawing a judgement on the story thus far seems to miss its attempt at chaos—it certainly accomplishes what it intends to do. But the fact that Gabrielle faces off against male authoritarian figures, including her principal and a cross-wielding priest, suggests a new entry in the werewolf feminism niche, which sport such cinematic gems as Ginger Snaps and When Animals Dream. Only future issues can confirm that subtext. She Wolf isn’t for everyone; its intentional incoherence and cultural scavenger hunt may throw off most mainstream browsers, much like the haphazard slashers of the era in which it’s based. But Tommaso employs such thoughtful visuals and design—just check out the image that frames Gabrielle pursuing a wolf, leaping from left to right, juxtaposed against the bisected panel beneath showing the wolf lunging opposite. 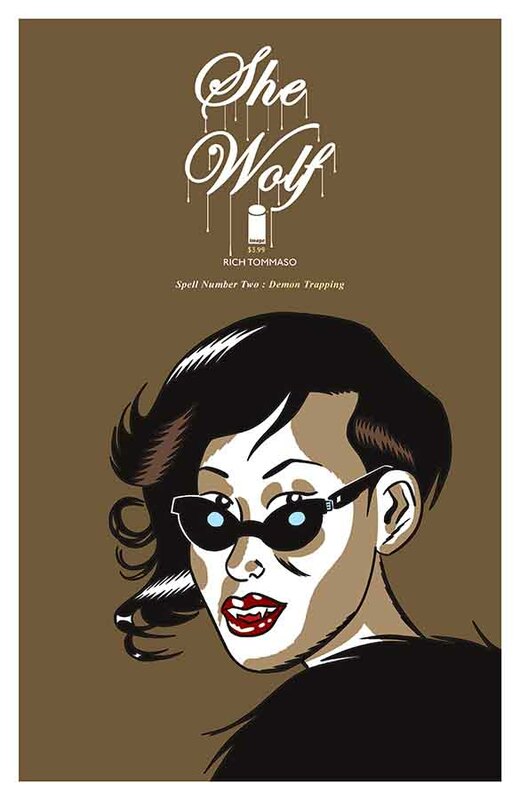 She Wolf howls with a love of exploitive genre that can most closely be equated with Gilbert Hernandez’ genre homage work in Fatima: The Blood Spinners and Girl Crazy. Similarly, it’s a much more artful depiction of trash culture than the source material ever provided.